Kate Mulvany's adaptation places both queens centre stage, providing an excavation of their shared humanity and grave shortcomings. Elizabeth, bone-tired and wigless, weeps as she signs Mary’s death warrant. She blows her nose once, then again, a commonplace gesture that registers as remarkable once you remember that this is a story of queens, and you are beholding Gloriana. It’s a female bodiliness rarely presented onstage, being neither sexualised nor bearing the signs of violence. Instead, it’s utterly mundane, unpretty in the way that corporeal matters often are. 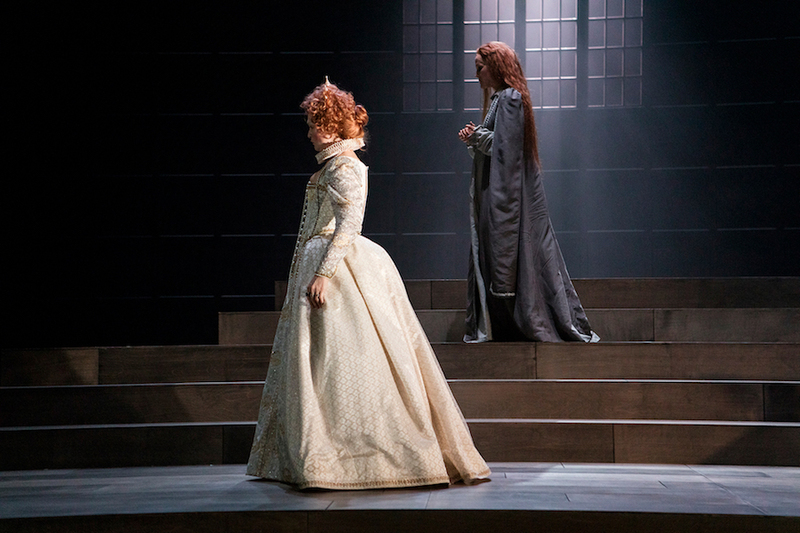 This attention to detail and deep humanity, conferred by Kate Mulvany’s adaptation, Lee Lewis’ production and Helen Thomson’s portrayal, makes this new take on Friedrich Schiller’s 1800 play Mary Stuart completely electrifying. 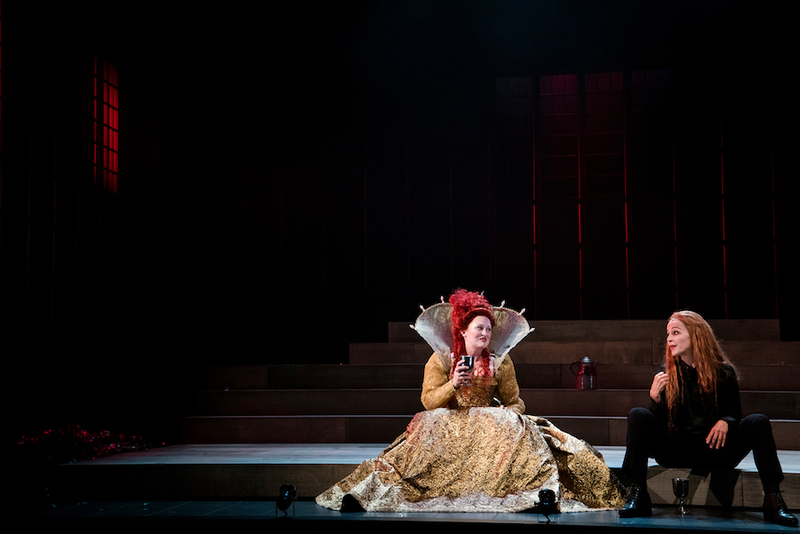 Mulvany’s bold adaptation recentres the queens, shearing away nearly every male soliloquy and interaction held exclusively between men, of which there are an abundance in Schiller’s text. This doesn’t detract from the play’s vibrant political context or underplay the male courtiers’ constant machinations. Rather, Mulvany simply trusts us to understand the pressures exerted on Elizabeth and Mary through their increased presence in the play, affording both an interiority not available to them in Schiller’s original. Part of this is a judicious recalibration of the way Schiller tends to lionise Mary and condemn Elizabeth, with one of Mulvany’s most satisfying changes the specific circumstances of their climactic confrontation. She shows us how both women are not only dogged by each other, but by the past – Elizabeth by her illegitimacy and Mary her complicity in murder. Her adaptation is also very funny, demonstrating a modern sensibility that meshes surprisingly well with Schiller’s verse. Mulvany’s daring is well-met by Lewis’ psychologically astute staging, which emphasises the inexorability of what’s to come and is full of the kind of images and sequences that insinuate themselves in your mind, lodging there long after you’ve left the theatre. It also possesses an admirable integrity – consisting of a single set, Elizabeth Gadsby’s design sees much of the action take place on steps signifying the fateful scaffold. With its austere black walls and barred windows that show nothing of the outside world, this oppressive environment establishes both queens’ sense of captivity. Mel Page’s costumes tell you everything there is to know about both women and how they wish to be read, while Paul Jackson’s lighting frequently creates outsize shadows that give this story not only a mythic quality, but a flavour of the horror film too. And you won’t soon forget Max Lyandvert’s compositions and sound design. Of course, any production lives or dies by the queens it fields. 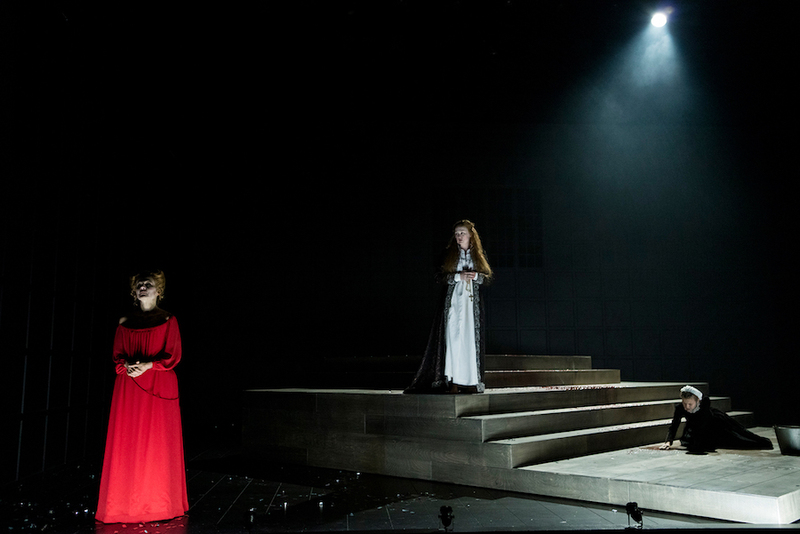 Luckily, Caroline Brazier and Helen Thomson give career-defining performances as Mary and Elizabeth respectively, sumptuously detailed and truthful. Brazier displays just the right kind of unnerving magnetism as the imprisoned queen, meaning you’re nodding in agreement when she excoriates the rather wet Mortimer for discounting her role in fomenting rebellion. Her delivery of Mary’s final confession, here a searing monologue invented by Mulvany, is a bravura performance that embraces both the queen’s real pain and self-delusion. Never mind that you can’t tell the difference – you find yourself swept up in the conflagration anyway. Most remarkable of all is how Mulvany turns the execution scene on its head. Rather than told to the audience by Leicester, here we’re forced to bear witness to an act of mutilation, showing a long fetishised moment of sacrifice for the violent act that it is. Thomson’s Elizabeth is possessed of a different kind of charisma, wielding a sense of humour that turns brittle in a flash. Mulvany adheres closely to the rhetorical devices Schiller uses to differentiate between the two queens. Where Mary is impetuous and demonstrative, Elizabeth is often direct and controlled, employing words that find their mark swiftly. Both actors handle this brilliantly, Thomson’s gift for comedy on full display as she dresses down an ambassador who assumes she needs tutoring in French. But she also brings unbearable pathos to Elizabeth, showing us a woman grappling with infinite fears – of her own illegitimacy, of shedding blood, of dereliction of duty, of being usurped and possessed. The scene in which she condemns Mary to death suspends time, so great is its impact. When the two women meet, it’s unlike any version you’ve ever seen. Here, not only is the reality of this confrontation called into question, it’s also depicted as occurring without any witnesses. The two cousins sit on the grass in the dusk, Elizabeth in bare feet, gladly offering Mary wine. Strange intimacy is mingled with the fury of long-held grievances, and when these are breached the women argue with a precision that suggests both have imagined this encounter many times over. It all builds to a nightmarish climax, completely alien to the scene’s initial sense of quiet companionship. Brazier and Thomson are supported by a strong ensemble, all of whom have the measure of Mulvany’s script. Tony Cogin is a dangerously single-minded Burleigh, with Peter Carroll the voice of moderation and mercy as Shrewsbury. Andrew McFarlane’s Leicester is foppish and ineffectual, turning predatory on a dime, while Simon Burke shows us the decency of the gaoler Paulet, ill-equipped to handle the compulsive politicking of his peers. Appropriately, Fayssal Bazzi plays Mortimer as if he were the star of the story, while comic relief comes from Matthew Whittet’s outrageously Gallic Aubespine and Rahel Romahn’s hapless Davison. 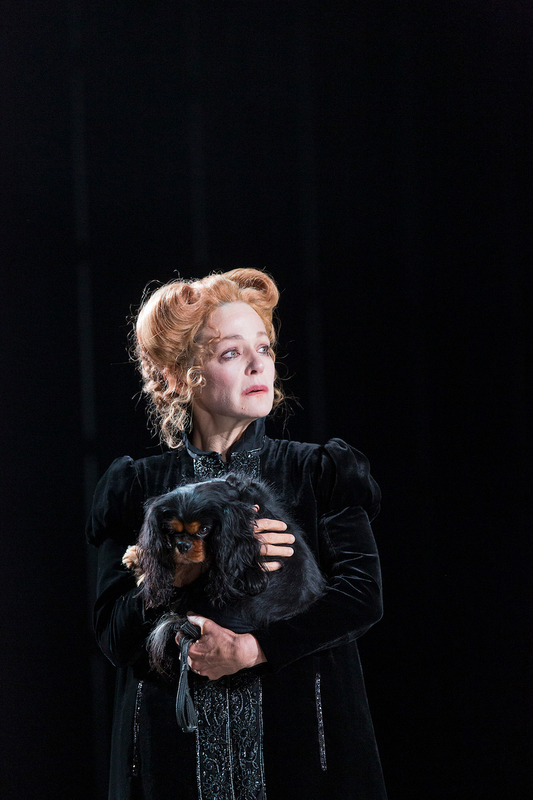 And in the non-speaking role of a young serving girl, Darcey Wilson drives home the separation of both queens from female company and those women in even more powerless circumstances. 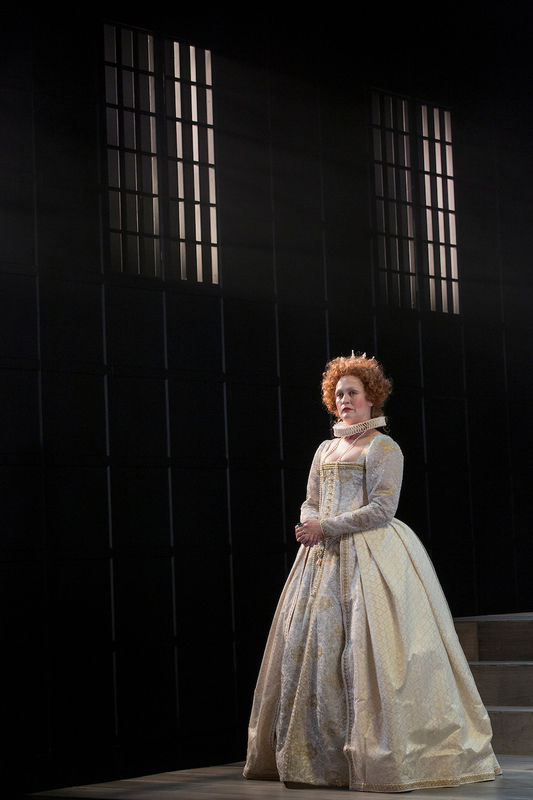 Perhaps the most powerful aspect of Mulvany’s adaptation is how well she captures Elizabeth’s failure of moral nerve, possibly the play’s greatest tragedy. As Mary ascends the scaffold, believing she has achieved a higher, truer form of freedom, we understand all too well that Elizabeth has bought her own triumph at the expense of her principles, her true freedom as a human being. The Elizabeth we encounter at the end is a queen disillusioned and metaphysically trapped, to be haunted forever by Mary. Absolutely not to be missed. Lucy Kirkwood's latest sees an excess of themes redeemed by emotional truths. The Artistic Director, whose tenure has been distinguished by record ticket sales and a growing subscriber base, will step down in November. 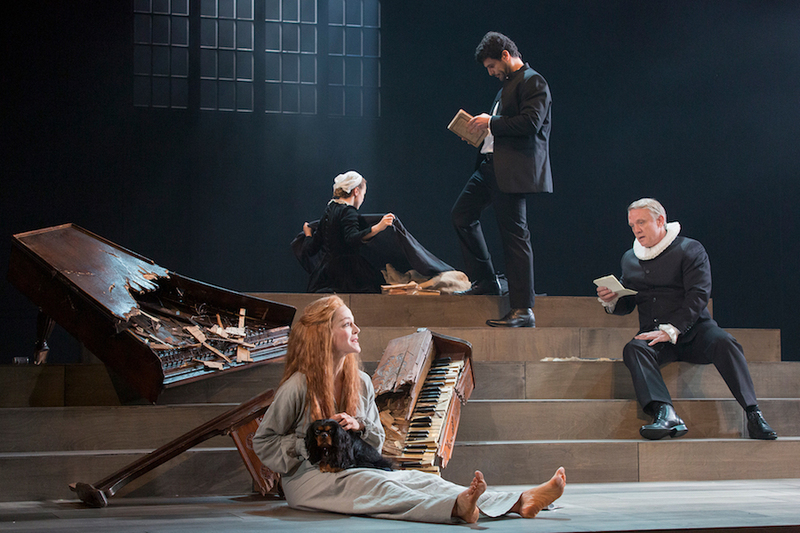 The acclaimed production will be seen in Europe for the first time this August. Kate Mulvany is brilliant in this raw but heartfelt, life-affirming show. The Fellowship is a prestigious professional development program for emerging and developing directors. With the orchestra’s lease at Circular Quay ending in December and delays to new studios in Pier 2/3, the orchestra will have to find a new home in 2020. First presented to Dame Joan Sutherland, the Opera Australia Trophy recognises Moshinsky’s service to the company and contribution to Australia’s operatic landscape. The acclaimed British actor, best known for her Hamlet, will appear with Sydney Theatre Company in August. Nakkiah Lui takes a swing at Australian politics in a wildly funny satire that out-Canberras Canberra. We talk to the playwright as she prepares to make her mainstage debut in her own play. Sydney Theatre Company has received 11 awards in total. An exciting, ambitious new Australian play, in six languages, that unites the personal and political in powerful, moving fashion. Australians make a strong case for Saariaho’s well-travelled oratorio, but can’t entirely overcome the work's curiously dissatisfying nature. Sydney Theatre Company leads the charge this year, becoming the first ever company to make a clean sweep of the Best Mainstage Production category. With the year drawing to a close, we look back over the theatre that wowed our critics in 2018. Sarah Peirse is masterful as a Miss Docker we'll all recognise.